I mentioned yesterday that I had gone to the lab to get medical work done. I realize I’m not as young as I once was, although my Wii Fit instructor/avatar seems pleased as punch with the shape I’m in. But in preparation for this trip,I knew I’d better find out anything and everything that’s wrong with my health before I go. I especially wanted to make sure my leg is in good shape. 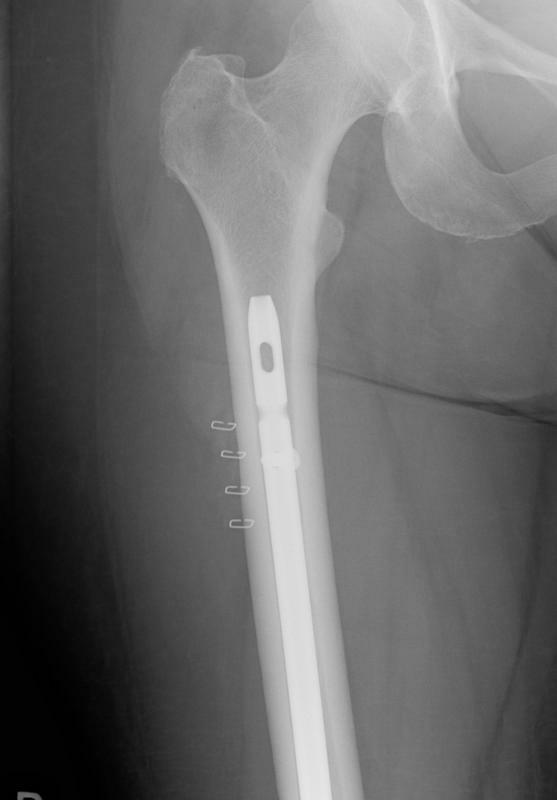 Several years ago, I broke one of the most break-resistant bones in the body – the femur. The thigh bone. I did it snowboarding. My DH had sent me off that morning with a cheerful “Ha,ha, don’t break your leg!” Well, within one hour of getting to the mountain, I was face down in the snow, unable to get up. Never having broken a bone before, it was an unusual experience. Also, being in Japan and not speaking the language, it was especially unusual. I think the “rescue” people thought I was just an old American lady slacker, whining over nothing. OK, here’s the warning. 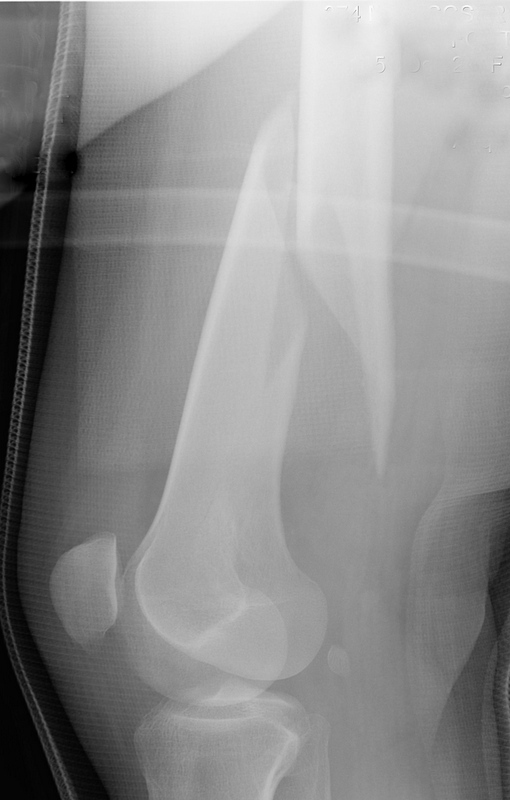 I’m OK with these x-rays of my leg. But others have turned slightly green at the sight. If you tend to turn green, I advise you to scroll down and avert your eyes for a bit. No problem, though. The American military doctors were excellent. I never had a cast of any kind. Three tiny one-inch scars. My care was wonderful. And, although I was NOT HAPPY at the time, the Air Force physical therapists had me out of bed and very gingerly back on my feet the next day. 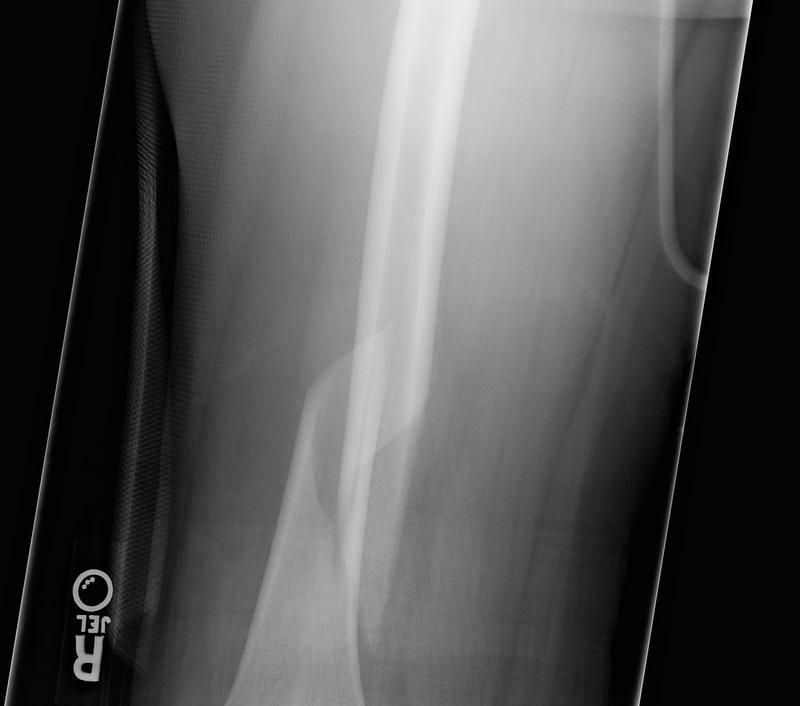 As I recall, the PT to get the strength back in that leg was much more painful than the break. Thanks to my PT wizards, my recovery was swift. Within a week, I was very carefully getting around on crutches, and, within months, had climbed Mount Fuji, pain free (except for the pain of climbing Mt Fuji, but that’s another story). However, years later, the site of the break occasionally gives me a little discomfort. So, I wanted to take a peek inside, before the trip, to make sure nothing weird was going on. I suspected the discomfort was caused by my simply being out of shape and my poor muscles not being able to handle stress. But for an 800 km walk, I needed to be sure it was just me failing my body, not technology failing me. Well, I saw yesterday’s x-rays. They looked excellent. Even better than they did years ago. No slightly jagged edges where the original break had been, everything looking clean and smooth, like a normal bone, just with a giant nail running from top to bottom. The medical people call it a nail, I think it looks more like a sewing needle. The metal does not set off airport security. So, one more hurdle jumped over. 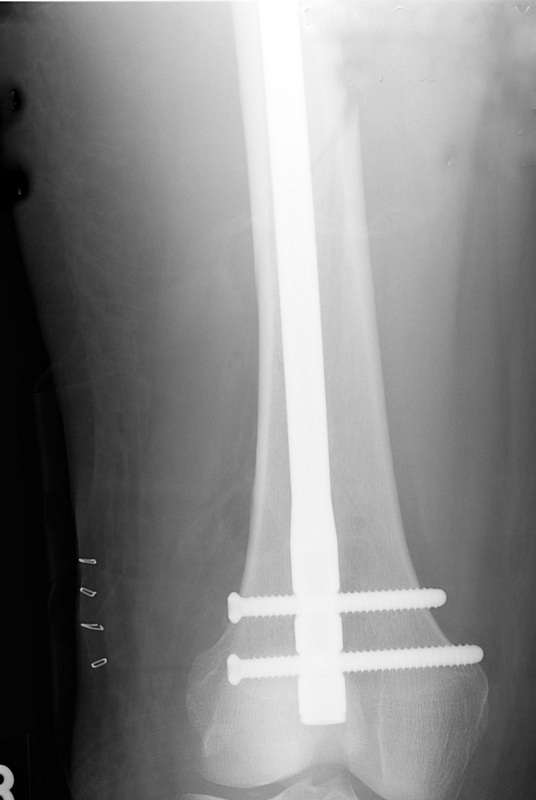 The leg is in technologically good shape. I can’t blame anything but my own laziness and “junk in the trunk” for any aches and pains. Thanks to those amazing military doctors, nurses, and therapists, not to mention the craftsmen who kindly put in hours building structures so I could get around our house, I’m no worse off than before. All of their names will go with me on my Camino, on a slip of paper, so I can remember them in my prayers along the way. My prayer list will be long, as I remember how blessed I am. A big hug to my DH. And, no, I no longer go snowboarding. This entry was posted in Fitness, Religion, Travel and tagged Camino de Santiago de Campostella, exercise over age 60, God, health, military spouse, training, trip preparation. Bookmark the permalink.